➻ It’s no secret that we love Kerry Lord’s adorable amigurumi designs – and what could be more adorable than cute crocheted dogs? This collection contains patterns for 50 breeds, from a husky to a rottweiler. The designs are split into beginner patterns, which use only chains, slip stitches and double crochet, and advanced, which include loop stitches and colour changes. This is a great source of gifts for any child or dog lover. with dried petals and a beautiful phone case. fabrics. Stretchy jersey can be tricky to sew with, so this collection is packed with tips for choosing materials, getting the correct fit and using your sewing machine just right. Once you’re prepared, Tilly has a selection of stylish patterns to make, from fashionable skirts to comfy tees. READER OFFER! 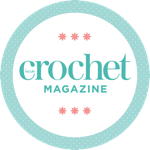 Readers of Inside Crochet can purchase Tilly And The Buttons: Stretch! for the special price of just £17.50 with free UK p&p. To order, call 01256 302 699 and quote code PG5. For a chance to win, visit our competition page and throw your name in the hat. Competition closes 25 April 2018.